As temperatures soar in the U.K to around 28 degrees and today it's even hotter than in Egypt. I decided to make another summer dish I have not made in sometime and to be truthful I don't know why because it is a epic dish, the combination of Banana's,Coconut and Chocolate is like a classic film about to win the Palme d'or if you get my meaning.I am a great fan of all foods and very interested in food stories,facts and history so after a bit of research I decided to share with you some things about the ingredients we probably never ever knew so lets start with Bananas must be transported over long distances from the tropics to world markets. To obtain maximum shelf life, harvest comes before the fruit is mature. The fruit requires careful handling, rapid transport to ports, cooling, and refrigerated shipping. The goal is to prevent the bananas from producing their natural ripening agent, ethylene. This technology allows storage and transport for 3–4 weeks at 13 °C (55 °F). 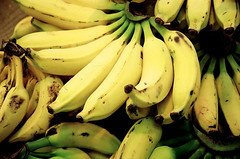 On arrival, bananas are held at about 17 °C (63 °F) and treated with a low concentration of ethylene. After a few days, the fruit begins to ripen and is distributed for final sale. Unripe bananas can not be held in home refrigerators because they suffer from the cold. Ripe bananas can be held for a few days at home. If bananas are too green, they can be put in a brown paper bag with an apple or tomato overnight to speed up the ripening process. Now moving on to the Coconut. Coconut milk, not to be confused with coconut water, is obtained primarily by extracting juice by pressing the grated coconut's white kernel or by passing hot water or milk through grated coconut, which extracts the oil and aromatic compounds. It has a fat content around 17%. When refrigerated and left to set, coconut cream will rise to the top and separate from the milk. The milk can be used to produce virgin coconut oil by controlled heating and removal of the oil fraction. This is a form of milk that is accessible to those who wish to follow a vegan diet..
Now after that brain sapping info let's move on to the recipe. 1.Place the biscuits (cookies) in a plastic bag and crush with a rolling pin. Pour into a mixing bowl. Melt the butter and stir into the biscuit (cookie) crumbs until well coated. Firmly press the biscuit (cookie) mixture into the base and up the sides of a 20 cm/ 8 nch springform tin (pan). 2.Beat together the soft cheese and caster (superfine) sugar until well combined, then beat in the grated coconut and coconut-flavoured liqueur. Mash the 2 bananas and beat them in. Melt the dark chocolate and beat in until well combined. 3.Sprinkle the gelatine over the water in a heatproof bowl and leave to go spongy. Place over a pan of hot water and stir until dissolved. Stir into the chocolate mixture. Whisk the cream until just holding its shape and stir into the chocolate mixture. Spoon over the biscuit base and chill until set. 4.To serve, carefully transfer to a serving plate. Slice the banana, toss in the lemon juice and arrange around the edge of the cheesecake. Drizzle with melted chocolate and leave to set. 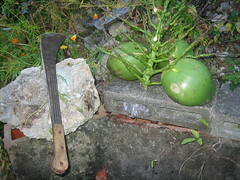 To crack the coconut, pierce 2 of the 'eyes' and drain off the liquid. Tap hard around the centre with a hammer until it cracks; lever apart. This does have some delicious flavors in it. The chocolate chip cookie base is a great idea! Also, I love tropical flavors, so I am sure I would enjoy this. The presentation here is really enticing as well. Hope you are enjoying the weekend! This is definitely the right weather for tropical fruits, and chocolate chip cookies are fabulous for any cheesecake base.Glad you like my presentation I'm always working on making my posts and recipes more enticing.Thanks Tina for your ever encouraging words. My gosh, this looks heavenly!! I'm a big coconut fan and when I see or hear there is coconut in the food/dessert, I can't help myself having at least a bite (even I'm full) but usually end up with finishing it. =) This cheesecake is AMAZING! That is one perfect looking cake Mac!! The Pie Looks Scrumptious. TY for stopping by! !